The eye sees, and the heart desires. People cannot help when an improper impulse comes to mind, but they certainly can stop themselves from harboring the thought and allowing it to dominate their thinking. Yet, sometimes one may be responsible even for the impulse itself. While some impulses are completely spontaneous, others arise out of stimulation. If a person reads, hears, or sees things which can provoke improper thoughts and feelings, he or she is then responsible for the impulses that are the consequences of that reading, listening, or observing. This concept is especially important in our era, when not even a semblance of a code of decency exists as to what may or may not be publicly displayed. All varieties of media exploit our basest biological drives. Given the interpretation of the right of free speech under which such provocative displays occur, the government has no way to restrain them. However, each person has not only a right, but also an obligation to be his or her own censor. No one has to look at everything that is displayed nor hear everything that is broadcast. Those who fail to exert their own personal censorship are tacitly stimulating immoral impulses, and for that alone they are liable. …try to avoid looking, hearing, and reading things which can have a degenerating effect. I know that Rabbi Twerski was thinking of something else entirely, but when I consider trying to avoid exposing myself to things that have a “degenerating effect,” I have to include the world around me, including the world of “religion.” Well, “degenerating” isn’t the right term. “Discouraging” is. Although you won’t read this until Sunday morning, I’m writing this on Thursday in response to my Wednesday night meeting with my Pastor. We were supposed to be discussing Chapter 8 in D. Thomas Lancaster’s book The Holy Epistle to the Galatians, but we got sidetracked on a few things. I bring up the book because of my Pastor’s response to it. He told me that he was having difficulty accepting some of Lancaster’s assertions early on in the book out of concern that if he assented, he would end up traveling down a trail he didn’t agree with. That’s how I felt last night as Pastor and I talked about salvation, Jewish people, and the future of Judaism and Torah. I felt like I was being led to agree with doctrines that I wasn’t comfortable with but didn’t know how to refute. In going over the little pamphlet about Baptist Distinctives (that is, what makes the Baptist church different from all other churches), I could feel myself being tugged down the “garden path,” so to speak. I ended our meeting by stepping out of the bowl of alphabet soup, all the letters and words of denominational doctrine and distinctives, and exploring actual experiences and relationships. I’ve often imagined what it would have been like to live in the late Second Temple period in Jerusalem. 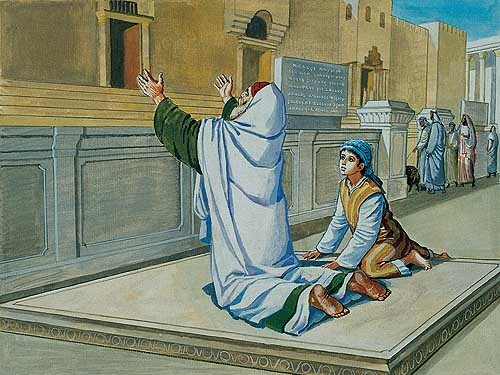 What would it have been like to go into the Court of the Gentiles at the Temple. How many people would be there? Who would I see? What would the air smell like? Then, I’d humbly kneel and pray to Hashem. This close to the actual “house of prayer for all peoples,” would I feel the tangible presence of the God of Israel? Would I hear the songs of the priests ministering in the inner court? I’ve often imagined what it would have been like to be one of the non-Hebrew shepherds tending the flocks of Abraham in Canaan. In the heat of the day, I watch him in the distance, studying his mannerisms and appearance, knowing that this is a man, among all human beings, who has spoken to God “face to face.” In the evenings after a meal, around the fire, would he teach us of his God? What would he tell us about a relationship with Him? How does one pray to the God of Abraham as a humble shepherd? In blessing Abraham, would I be blessing God and also myself? What a hard and yet simple life, living close to a prophet and to the One God. We read “Bible stories” about “Bible characters” as if reading morality fables or fairy tales. We “know” that they’re real, but do we? It’s just words on a page. Does “Biblical inerrancy” result in forgetting that Abraham was and is a real human being? Do we discount the moments of his life we don’t find in the Bible but nevertheless, moments that must have occurred? When, in reading the Bible and praying, do we allow Abraham to stop being a work of “fiction” and become a living, breathing, talking, experiencing human being? Religion is all about systems, and Christianity, in all of its flavors, is just another series of systems. The systems exist to tell us what the Bible means and how we are supposed to live our lives. The systems tell us what is right and what is wrong, who is right and who is wrong, and what, if anything, we’re supposed to do about it. But the systems totally ignore awe, majesty, terror, magnificence, and everything else everyone from Abraham in Canaan to a lowly, nameless goy in the Court of the Gentiles would experience in a living, breathing, bleeding, authentic, moment-by-moment encounter with God; the sights, sounds, smells, touches, tastes, thoughts, feelings, and dreams of actually being there instead of just reading the Bible and especially instead of filtering the Bible and everything else through religious systems that so very much remove us from authenticity and the jarring, electrifying, naked connection to our Creator. 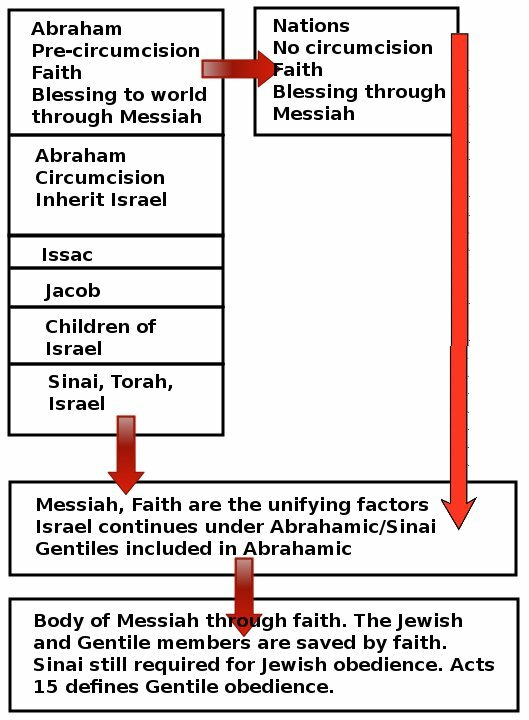 I tried to explain how I thought that Jews and Gentiles both are a part of the unified body of Christ and yet the Jewish connection to the Sinai covenant and its conditions, the Torah, are not undone by that unity. I drew a diagram, which I’ve reproduced below, to explain my thoughts. “But the Jewish people haven’t accepted Christ, so they can’t be saved,” he says (I’m paraphrasing). “Not just faith in ‘a Messiah’ but ‘The Messiah,’ in Jesus,” he says (I’m paraphrasing again). Something’s wrong. I’m agreeing to things I’m not sure about. My Pastor is so sure of so many things that I think we can only see through “a glass darkly,” and that exist as much in the realm of God as they do in the material world. I don’t know how to explain it, so it’s difficult to know what to say. And there are so many other people who seem so sure about unsure things. I suppose it shouldn’t have surprised me that U.S. Army PFC Bradley Manning, just one day after being sentenced to 35 years in Federal Prison for releasing 700,000 secret military documents to Wikileaks, should come out as transsexual and declare that he wants to live the rest of his life as a woman, obviously changing how prison will be “applied” to Manning. Religious systems. We craft them saying that we see their foundations in the Bible. But we craft them to say whatever we believe is important to us, and thus they reflect the political and social agendas and imperatives of the occupants of these systems. Extracting religious systems from the Bible is supposed to be guided by the Holy Spirit, but because human beings are involved, they end up dramatically contradicting each other, sometimes (often?) based on generational changes in attitudes. I’ve mentioned before that I don’t think I’d make a good Baptist, not because I have anything against Baptists per se, but because I don’t think any denomination or modern religious stream, old school or new, holds all the keys and unlocks all the doors. I know they think they do. They all think they do. But being an outsider, I can see a different perspective. I can see lots of perspectives, and none of them make a lot of sense. Pastor pretty much agrees with what he reads in Thomas Schreiner’s book 40 Questions About Christians and Biblical Law and I can barely stand a single thing Schreiner wrote. Pastor is also reading Rudolph’s and Willitts’s book Introduction to Messianic Judaism: Its Ecclesial Context and Biblical Foundations. He’s just finished the chapter written by Scott J. Hafemann, “The Redemption of Israel for the Sake of the Gentiles” and he likes it very much. I’m going to re-read it to refresh my memory of the text. What did the Pastor see in this chapter that we can agree upon? Can there be a peace? Or is the only peace in the presence of God and to heck with the systems? Good morning, James… When it comes to mainstream Christianity, I think I refer to one of my “stumbling blocks” as being the “relative densities” of individual “Christian cultures.” For instance, the Baptists have a general over-arching culture; each branch a more particular culture, each local congregation a more particular culture and so on. Such is the way, in my experience, of the “non-denominational evangelical” assemblies, as well, the Pentecostals, mainstream Protestant, Catholic, so on and so forth. For example, in terms of observation, I find certain interpretations of broad concepts, such as “joy in the Lord,” for instance, are interpreted, then “actualized” in cultural expressions of language and attitude. For instance, “joy in the Lord” may overly express itself by way of certain individuals within an assembly humming and singing hymns and worship songs all day long, everywhere they go, or using a certain axiomatic response to “How are you?” as an almost coded response that unofficially deems certain individuals as in a popular “clique.” It’s a highly nuanced thing, but something I find rather claustrophobic about churches that I attend and or visit over the years. I refer to it as “cultural density” – a ratio of a group’s solidarity to its sociability – which ultimately categorizes “insiders” and “outsiders” in a process that may be completely unnoticed by the core group. Thanks for stimulating the thought… I am sensitive to the “unwritten behavioral guidelines” that often operate unofficially within social human groups. I find that being Messianic in orientation is a great opportunity to identify, define and lovingly challenge said “dense cultures” wherever I go in a healthy way, which, while stimulating and gratifying in an “adventurous” way, nevertheless leads to a certain “loneliness” that leads me right to your wistful considerations of being a goy in the court of the Gentiles in the first or second century, experiencing the close proximity of the Shekinah in person. And I think the relative cultural density of a group is a result of how their interpretations of Scripture and other conncected factors have become actualized into a system. I suppose the bottom line is that we depend primarily on our one-to-one relationship with HaShem and find and appreciate our horizontal relationships wherever we can find and get them… accepting and embracing and navigating the relative culture densities of distinctive groups along the way as best we can. Have a great week… thanks for being willing to share the introspective p.o.v. as it stimulates similar processes within the reader… this reader, at least. I think all the various forms of Christianity and Judaism (and probably anything else) operate as cultures and as religious groups, the “rules” of those cultures define God, the meaning of the Bible, and pretty much everything else. Religious Judaism is more overt about it, which is often what Christianity picks on, but Christianity uses similar or the same dynamics, but somewhat more under the table. Periodically in my church journey, I encounter culture shock of a sort. I thought I’d only have to go through it once, but it seems as if it’s a repeatable event. As I was looking outside this morning, I had to admit that Judaism would be just as alien a culture if not more so (my history in One Law/Hebrew Roots doesn’t count as a “Judaism,” since it was a Gentile attempt to replicate some aspects of Jewish worship, but it didn’t have a truly lived Jewish experience). I wonder if what I’m encountering after all this is Christian culture rather than God. If I’m supposed to focus on denominationalism and distinctives, in all of the minutiae, where will God be found? As mentioned, I yearn for intimacy, which I’m seeing as a process of ‘uncovering’ or ‘recovering’ as the story suggests, rather than “discovering” something that lies outside of ourselves in the form of opinion or interpretation. Of course, there must be some balance, some connection to things external, and yet, this is a distinction of epic significance, I think: recovering vs. discovering. Which is why I reacted to your introspection concerning proximity to the Shekinah. For the last third of my life, I seek to “see the face of the King” more as He discloses through Torah, etc., than how others have interpreted His disclosure. Not by becoming monastic, per se, but more solitary in terms of my processing of thought. The metaphorical world of mystical Jewish thought has been a precious “God-send” in this way, in terms of this climbing up the mountain to see God. I go forth each day to “gather sparks” toward tikkun olam to please Him, to hasten the coming of Messiah and somehow must stay within that context, that “culture” or paradigm, so to speak, to retain and express joy. All of which I am coming to see as a process of “uncovering” or “recovering” what HaShem has already explained to me rather than “discovering” what He “has already said” by way of outside, external sources. I am very careful in my reading behavior, very discerning about who I listen to, etc. It is a matter of pruning away that which distracts as well as ingesting that which nourishes. And I think that exposure to Christian culture is quite often an obstacle or distraction more than it is a door or window. It changes the direction of the light entering into the world. It systematizes that which ought not be systematized; organizes that which exists in its purest state as organic. I assume you mean this book, Dan. I think that’s what I need right now. Sometimes all of the little “details” of studying the Bible from this perspective or that, advocating one doctrine and criticizing another has gotten pretty wearing. Not that I’m likely to stop, but maybe I also need to infuse something else into my efforts to “understand” God. Yes. Rabbi Aaron starts at the point I needed to return to some time ago, when my sense of man’s views of God seemed to fall short of His majesty… even when they mentioned His majesty. I started reading Kabbalistic thought when Levertoff was published by FFOZ, and my view of God was catapulted into the realms of infinity and beyond, somehow beyond the residence of “God” prior. Rabbi Aaron starts out right where I needed to return to, the very beginning, challenging the word “G-o-d” itself. I recommend it for just the spot you’re in! And may He bless you with much new insight… very exciting! Found out the book is at my local library. I’ll check it out (literally) tomorrow. Thanks. Thanks so much for sharing your thoughts with honesty on this blog. To know that there are others who struggle with similar questions about the church, doctrine and where we as gentile believers fit within the bigger picture of God’s relationship with Israel is so helpful. I appreciate the way that you don’t claim to have all the answers, but offer suggestions and if anything your posts often throw up more questions than answers. Anyway, just wanted to encourage you and say thanks, because I have found your blog really helpful in helping me to clarify my own thoughts. Thanks, Hannah. I appreciate your kind comments. Blessings. James, I want to thank you for your honesty and openness, and thank you Dan for your insights. I agree with Bill Bullock’s take that all religious systems are Babel, and the home, not the church/synagogue etc. was meant to be the center of worship and learning. Many years ago I was given this wise advice, “Don’t seek people who are like-minded, because you will always find something to disagree about. Seek instead, people who are like-hearted.” And then that person went way off the rails into extreme patriarchy and probably wouldn’t even speak to anyone who disagreed with him in the slightest any longer. So, I figure that should be a warning. Chaya, thank you for the kind words. One of the most precious elements of pursuing a more Jewish practice of faith in Messiah is the home-centered aspect. Every Erev Shabbat I am provided the opportunity to lay my hands on the heads of my sons, Joshua and Aaron, basking in the light of the candles lit by my wife, Jodi, and pray a b’rucha to my Father in heaven that His Hand be upon their lives all the days of their lives. In terms of the comment that “all religious systems are Babel,” upon listening to the interview, I made a note in my journal that this struck me as an apt description of theology, in a way. It is a secondary world in that it is but a description of what it is talking about, not the real thing. When we rely too heavily on hardened theological constructs, we are in trouble. I seek interaction with the “primary world” of HaShem, not the secondary world. Yeah. I can see I might have been barking up the wrong tree, so to speak. Tomorrow’s “morning meditation” is about letting go. It has a Pixar theme, so it should be entertaining for that reason alone. 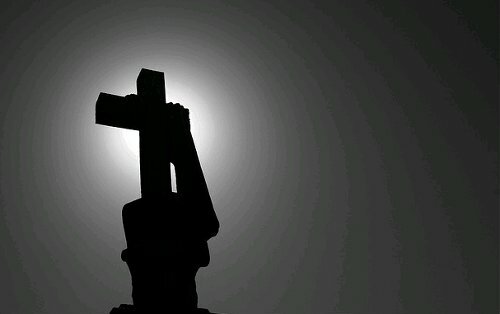 If you own it, may I borrow your image of the broken cross? Thank you.